The Celtic Cleaner provides window cleaning, solar panel cleaning, roof cleaning, commercial cleaning, and more. Our motto, “professional window cleaning – with an accent”, is not merely a reference to the charming accent, nor to the Scottish roots of our founder. It’s a guarantee that the quality of service you expect, nae, that you deserve, is only a phone call or a few clicks away! With 10 years experience, you can trust us to get the job done right. Fàilte – A Scottish Welcome! Press play now to hear all about us in a charming Scottish accent! Please fill out the online request form below for an instant FREE quote, or call us on 360-768-CELT (2358) to find out more! 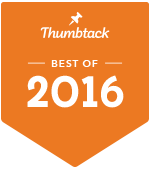 Click above to find out why we’re #1 on Thumbtack for 2 years in a row!